Just saying the title Are You Afraid of the Dark? will make any ’80s or ‘90s baby quake with fear, and, if they immediately think about, say, “The Ghastly Grinner,” perhaps soil themselves. Debuting on Canada’s YTV on Halloween 1990, before its Nickelodeon premiere in August 1992, the family-friendly horror anthology series was an amalgamation of things that had never been combined before Although it was a TV show for kids, Are You Afraid of the Dark? had straight-faced drama, legitimate scares, unhappy endings, and enough mind-scarring images to keep pediatric therapists busy for decades. Initially making noise as part of the network’s now-iconic original SNICK Saturday night lineup, Are You Afraid of the Dark? ran for seven seasons, produced 91 episodes, and remains a cult classic for nostalgia lovers. The behind-the-scenes story is just as eventful. Starting off as one of Nickelodeon&apos;s many rejected pitches, Are You Afraid of the Dark? endured through network concerns and higher-ups&apos; fears of traumatizing children to, among other feats, help introduce the world to a young Ryan Gosling, win an NAACP Award, and turn co-creator D.J. MacHale into a successful YA fiction author. In this candid, exclusive interview, MacHale walks us through the glory days of Are You Afraid of the Dark? and decries the current state of Nickelodeon and kids TV shows. There’s always a strong nostalgia online surrounding the old Nickelodeon shows, but, for whatever reason, Are You Afraid of the Dark? doesn’t seem to be talked about as much as other Nick shows. Why do you think that is? I don’t know the answer to that, honestly. It may have to do with the kind of show it was—it’s not necessarily, nor was it necessarily, a broad-appeal show. You kind of had to like that ghost story/macabre story thing to begin with, as opposed to, say, Clarissa Explains It All, which pretty much everybody liked. What I’ve found over the years is that there’s a huge, huge fan base, which maybe isn’t as large as some of the other shows but it’s equally as fervent. Is is weird that people like me still reach out to interview you about Are You Afraid of the Dark?, 20 years after its premiere? Not anymore. It used to, but I talk about the show more than when it was on. [Laughs.] And I think that’s for a couple of reasons. One is, the people who watched it are now adults who look back at it nostalgically, so they’re out there in the world and want to remember it. It’s that combined with the fact that I’m now an author, so my name is more known and I’m more accessible. Back then, nobody knew who I was, but now because of my books people know me. Plus, there’s also social media today, which makes people talk about things more nowadays than they did back when the show was on the air. They have the forums to talk about it. So all of that combined keeps shows alive. One way to really keep the show alive would be to finally release official DVD/Blu-ray collector’s sets, with all of the episodes. Is there a reason why that’s never happened? It seems like it’d be a goldmine. Well, that’s the question—why has it taken so long to come out? Just on regular DVD, forget Blu-ray. The problem is, I have no control over that kind of stuff. The show is co-owned by Viacom/Nickelodeon on the one side, and then this Canadian company, who were the show’s financiers. They have complete control over it. I don’t know why Nickelodeon has taken so long to do this, because there certainly is a demand for it. This past year, finally, they’ve started to put it out on Amazon’s streaming service, but that’s only happened pretty recently. I also don’t know why Nickelodeon doesn’t air it more—it’s free for them to air it whenever they want. [Laughs.] It’s a really big missed opportunity on their part. You can watch Rocko’s Modern Life a billion times but you can’t ever watch Are You Afraid of the Dark? You’ve got to be kidding me! I’ve been watching some old episodes online recently, and I’ve been struck by how Are You Afraid of the Dark? really doesn’t feel like anything else that’s ever been produced specifically for kids, now or then. The drama aspects of it, and how serious it takes itself—it’s still an anomaly when it comes to Nickelodeon’s programming history. That speaks to kids television in general, and what a sorry shape it’s in. That’s not to say that all kids television is bad—it’s just that the variety that existed back in the ‘80s and ‘90s does not exist anymore. Back then, you could get drama, you could get variety shows, you could get comedy, you could get animation and action—you could get anything. But not anymore. Live action for kids is comedy. That’s it. And it’s the worst kind of broad comedy. I’ve watched some of the current kids’ shows with my niece and nephews, and the characters are all the same—the kids are all advanced and the parents/adults are all buffoons. It’s also that the humor is snarky put-down humor, and that’s the easiest way to get laughs. I see it both as a filmmaker who used to make shows like this and as a dad of an 11-year-old girl, and I hate to have her watch these shows. She emulates that kind of behavior and that attitude. Even though it might be the “bad” kids who do all the snarky stuff, and by the end of the episode they might learn a lesson, it doesn’t matter—they get all the laughs, and they’re who kids remember. I think kids are really being under-served on TV these days, and part of that is economics. It costs a lot more money to produce a show like Are You Afraid of the Dark? than it does to produce whichever of these humor-based shows we’re talking about. It’s easy to produce sitcoms. I’d imagine that back in 1991, when you were pitching the show to Nickelodeon, Are You Afraid of the Dark? must have been a really tough sell. They turned it down at first. It was originally called Scary Tales, created by my partner Ned [Kandel] and I. We pretty much pitched exactly what we ended up making, and they were just like, “No, you can’t do this. You can’t scare kids. It’s not going to fly.” So we left; we were done. I left behind a three-page treatment of what the show was going to be. We went back a year later to pitch another show to them, which they also did not buy, but in the interim they’d hired a guy named Jay Mulvaney who really typified what was best about Nickelodeon back in those days. He found interesting shows, ideas, and creators and let them fail or succeed, and that’s how they ended up having so many great shows. So Jay was hired, and he went through their files one day, picked out my three-page treatment, and said to them, “How come we’re not doing this show?” When we’d gone back in to pitch this other show, they said, “Well, how about Scary Tales—is that still around?” This guy literally pulled it out of the scrap heap, and he had the vision to say, “This could work.” And, boy, was he right. 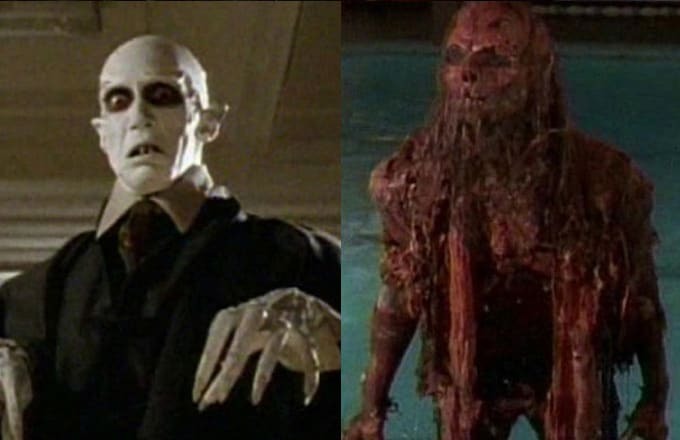 One of the reasons why I’m such a big horror fan now, at 32, is that I grew up with Are You Afraid of the Dark?, but at the same time, my dad had me watch all of the old Universal Monsters movies, too, as well as The Twilight Zone. So it was always cool to see how your show honored The Twilight Zone in so many overt ways, specifically with the “Submitted for the approval of the Midnight Society” story introductions. It’s obvious that “The Tale of the Midnight Madness” is a nod toward Nosferatu. You did a great job of working in classic horror and genre touchstones into a show for kids. So a lot of the stories, especially in the first couple of seasons, are—you may not recognize it—were jumping off of classic short stories. And that’s the thing about classic short stories, particularly supernatural stories—they’re always morality plays, there’s always a twist, the good guy doesn’t always win. That’s what so great about those kinds of stories, and that’s what Are You Afraid of the Dark? was. We rarely played it for laughs; there was some humor in there, but we didn’t go the Goosebumps route of over-the-top silly scares. We tried to make it feel real, to make the characters feel real. It’s interesting that you brought Goosebumps up. When I was talking to people about Are You Afraid of the Dark? recently, I’d say how there’s nothing else like it, and they’d say, “Well, there’s Goosebumps,” and I’ve never considered the two things to be that similar. The tones are so different. Are You Afraid of the Dark? has such an earnestness to its mission to scare kids, and the creators of other shows and properties either don’t think they can get away with that or don’t have the courage to try. Right, and it wasn’t even so much being true to being scary, although that was a part of that. It was more about being true to telling a story with some guts to it. A classic situation that happened again and again was… I didn’t write all of the episodes, though I did write most of them, but writers would pitch me ideas often. Inevitably, a writer would come up to me and say, “OK, I have a story about a haunted wallet, right? And if you hold onto this wallet, you’ll go back in time,” or something like that. I’d say, “OK, that’s cool, but who are the kids?” And they’d say, “Oh, they’re just a couple of kids, but this wallet, right!” That’d never work for me. I was always looking for stories about kids who I’d care about and be interested in, even if they never get a haunted wallet. If I care about those kids and what they’re going through, when they do get a haunted wallet, then I’m really going to sink into their story. That’s what we tried to do: have interesting character stories with real kids, and those kids happen to coincide with the supernatural. That’s just good storytelling, I’d like to think, as opposed to just, “OK, we’re going to have the kids do a Home Alone scream here, with their hands to their faces.” Like, “Aahhh, it’s the Boogeyman!” [Laughs.] That wasn’t what we were going for. Were there ever conversations about how dark the show could get? Because at the end of the day, it was still on Nickelodeon, yet there were several episodes that didn’t have happy endings. Some of the kids actually died or lost to the supernatural. Yeah, there were dramatic endings and deaths—there was some hairy stuff going on in some episodes. I don’t know because I haven’t tried it, but I don’t know if you can get away with that stuff nowadays, because we’ve become so conservative in this world. But we never had any pushback. We may have gotten Standards & Practices pushback on individual things, like a line here or there. There was one thing, and this was great—we did 91 episodes of that show, and there are 91 campfires, and we never saw anyone lighting the campfire. [Laughs.] You couldn’t show kids striking a match, because they didn’t want to teach kids how to do that and risk some kids accidentally burning down their homes, I guess. We put the fires out plenty of times but never lit any. So we got some Standards & Practices pushback like that, but as far as the tone or how scary and dark it got, we never got any pushback because Nickelodeon never got any pushback. They never received any complaints, saying, “What the hell are you doing?” The parents got that it was good storytelling. It wasn’t gratuitous violence or anything. But who knows, maybe the parents weren’t watching, and that’s why we never got any pushback. [Laughs.] It was just solid storytelling. It never felt exploitative the way a lot of horror movie are now. There was one thing I tried not to do, at least in the beginning, even though I was not always successful in not doing it, was… I remember as a kid, the things that would scare me were images. Those were the things that would stay with me. I’d see a horror movie and I don’t even remember what the horror movie is about, I just remember the face of some horrible thing. I’d have nightmares about that face. So in the beginning I was thinking, I don’t want to present any seeding, horrible image that may stick with a kid. The situations can be spooky—it’s Alfred Hitchcock 101, where the implication of what’s behind that door or in the hallway is scarier than actually seeing it. I didn’t want to present any horrifying images, and then eventually we did show some horrifying images. [Laughs.] But, again, never anything bloody or gory. It always went hand in hand with the story, too. 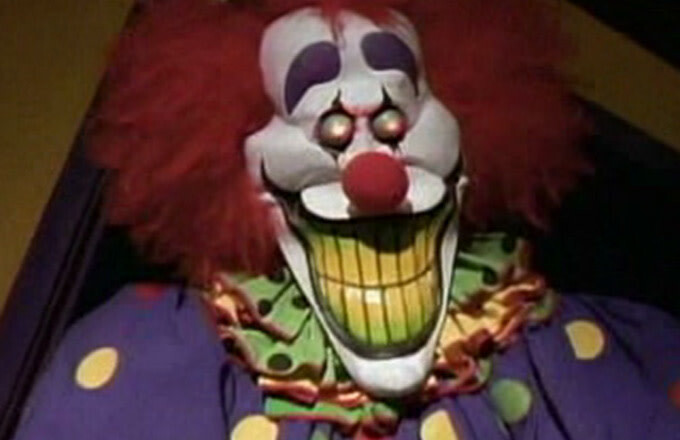 There were definitely some images that, whether intentionally or not, were real nightmare fuel, like Zeebo the clown, or the little girl in “The Tale of the Lonely Ghost,” where she’s written “Help me” all over the wall. Think about this—that’s the story of this little girl who was locked in a closet and essentially starved to friggin’ death, and she’s in a kids show! [Laughs.] Oh, my god! Maybe nobody was watching. Someone was asleep at the wheel someplace. Considering that you made 91 episodes, it’s pretty amazing how little overlap there was in those episodes. Granted, there were some recurring motifs, like clowns or vampires, but the ideas, for the most part, were always fresh. If you look at, say, The Twilight Zone, its final season is largely a collection of bad ideas poorly executed—they’d clearly run out of ideas and steam. How difficult was it for you to maintain that creative consistency? I’m glad you feel that way. I think maybe part of it is what I was saying before, where we never said, “OK, let’s make the vampire episode now.” It was always, “OK, what’s the interesting story about these kids” And, OK, let’s put a vampire in there, too.” As long as you had interesting kids in supernatural situations, and you’re just putting a recognizable boogeyman into it, it’s going to feel like a different story. I’m personally afraid of clowns, right, so we had a couple of different clown stories, but they’re ultimately different stories with unique characters in unique situations. 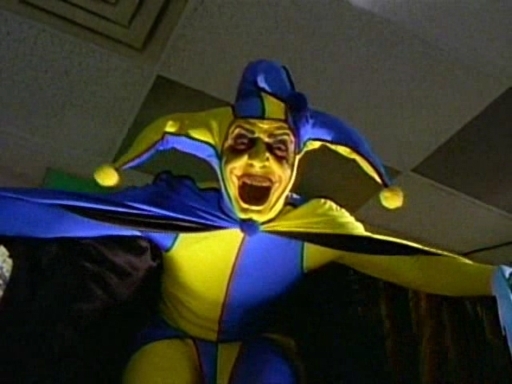 Another interesting thing about Are You Afraid of the Dark? is how it helped launch some very successful acting careers, particularly Ryan Gosling. When you were casting him, did you have a sense that he could be something special? And did that happen often, in general? Yeah, there were a couple, and Ryan was one of them. In fact, we did the pilot in ’91, and then we started the series in ’92 and completely recast the Midnight Society. Well, actually, the guy who played “Gary,” Ross Hull, in the series was the only one from the pilot—he played “Frank” in the pilot, the tough guy. But we recast everyone else. When we got the series together, I wanted to cast Ryan in the Midnight Society, because I knew the kid was really good, but then he got the gig with the Mickey Mouse Club, with Christina Aguilera, Justin Timberlake, and Britney Spears. He went down to Florida to shoot that, and it ran for two years. When he came back to Canada, because he lived in Canada, I got him in an episode of our show. The other one who jumped out was Jay Baruchel, who we cast in a bunch of episodes. He’s probably been, kid wise, in more episodes than any other kid. He was first in an episode called “The Dead Man’s Float,” and we killed him in the first scene. [Laughs.] We drowned him in a pool. I thought, “Oh, my god—this is a kids show and we’re drowning this kid!” I directed that episode, so I got in the pool with him, and we tied a filament to his ankle that ran down to a weight at the bottom of the pool and someone holding it at the bottom. I remember his mother was on the set, and said to me, “I can’t believe you’re killing my kid!” He was such a good kid and he lived in Montreal, so we ended up casting him in three or four more episodes. He was so good, easygoing, and great with comedy, and he got the irony of the stuff. Jay and Ryan were two kids I knew would go on to do big, great things. With the Midnight Society itself, that was such a cool way to honor the always-present host/storyteller construct used by The Twilight Zone and the old EC Comics. Was that where you drew the inspiration from for the Midnight Society—the old horror classics like those? I made what turned out to be a really brilliant move, and at the time I did it deliberately. The only reason I can say that is, after I did it, I completely discounted and hated it. [Laughs.] But as it turns out, my initial instinct was correct. Anthology shows are really tough to do and they’re really tough to get popular because people watch their favorite TV shows to see what’s going to happen to their favorite characters. What’s the continuing story? What’s going to happen to Bill this week? Well, anthology shows don’t have that. It’s a different cast every week. So I said, “OK, we need a lynchpin that’ll tie this thing together every episode.” We needed the same kids every week who, obviously, would be the show’s answer to Rod Serling. They’re the closest thing to continuing characters we’d have on the show. That was really smart, but the fact is, the whole time I was making that show, I cared so little about the Midnight Society. It was an annoyance. We shot a whole season’s worth of Midnight Society segments in one week, and I ended up writing about 95% of the Midnight Society scenes. So I had to all of the season’s scripts ready to go before we started shooting the Midnight Society’s scenes. I couldn’t just have one of the kids say, “Oh, this story is a really scary story, and it’s called ‘The Tale of the Scary Story.’” [Laughs.] I had to know what each story was about. We’d shoot two episodes’ Midnight Society scenes in one day. To me, the Midnight Society was never the interesting part about the show—the interesting part was the little movies that we made. But as it turns out, it was the exact right thing to do. That’s what people remember. It used to crack me up when people would say, “I like this Midnight Society better than that Midnight Society,” or, “I like this kid in the Midnight Society better than that kid.” I was always like, “Who cares? That’s not what the show is about!” But people do care, and they care for the reason I originally thought about it. They want to have recurring characters and know who comes back each week. Earlier in our conversation, you mentioned how back when the show aired, you weren’t receiving many interview requests. Bur during that time, did you ever get the sense that Are You Afraid of the Dark? was resonating with a large audience? Or did that come after the fact, through post-airing nostalgia? No, we knew it at the time. We saw the ratings, and the ratings were really high. I don’t know who the guy or woman was who came up with the idea and said, “You know, there’s a group of people who, on Saturday night, are too young to be on a date and too old to be in bed, and they’re watching TV on Saturday nights.” And that’s when they created SNICK. It was as much SNICK as Are You Afraid of the Dark?, if not more, that became a phenomenon. I really tip my cap to Nickelodeon for putting the right shows on at the right time, which nobody had done before. Nobody had ever programmed Saturday nights for kids—usually it was just Saturday morning programming for kids, but Nickelodeon had the foresight to program Saturday nights as well. That was brilliant. SNICK had the perfect lineup, too, especially with the weird and dark Ren & Stimpy leading into your dark and disturbing Are You Afraid of the Dark? Putting your show at 9:30 p.m., to end the block, was really smart. Everything about SNICK seemed very strategic. Absolutely, no two ways about it. And it goes back to what I said before—back in those days, kids had a choice and a variety. The first SNICK lineup went from 8 p.m. to 10 p.m., with four half-hour shows. The 8 p.m. show was a sitcom, Clarissa Explains It All, with Melissa Joan Hart; the 8:30 p.m. show was a comedy variety show, Roundhouse; then the 9 p.m. show was really the flagship show, because it was the breakout, and that was Ren & Stimpy, an irreverent show that got the choice 9 p.m. slot; and then you stayed up late to see the spooky show, which was Are You Afraid of the Dark? It was really brilliant on their part. The shows moved around over the years, but that franchise of SNICK was brilliant, and that was all Nickelodeon. Ren & Stimpy’s humor was so bizarre that it kind of put you in the right headspace for Are You Afraid of the Dark? If you watch Ren & Stimpy now, it’s still confusing how that show got on the air. [Laughs.] Exactly. The kids who really tapped into Ren & Stimpy, I don’t know if they would ever tap into Clarissa Explains It All. I’m sure there were some who watched both hours of SNICK, but generally speaking, there were different sensibilities at play with each hour. I didn’t even know that much about Nickelodeon at the time, but it wasn’t until our show had been on for a couple of years and I started getting feedback from the network and other places, saying, “Thanks for putting us on the map!” And I’d say, “What are you talking about? Hasn’t Nickelodeon always been on the map?” But it really hadn’t been. SNICK is what put the network on the map in the early to mid ‘90s. The show that you pitched to Nickelodeon after Are You Afraid of the Dark?, was it the same kind of anthology construct? Not exactly. It was called The Strange Legacy of Cameron Cruz, and it was about a psychic kid. And, again, it was a drama. It wasn’t silly. We did a pilot and it actually starred Jesse McCartney. It was about a kid who basically has this clairvoyant power and would solve ghost stories and other supernatural cases. It was OK; I don’t know if the pilot was great, but I thought the show really had potential. But the network told us that they were moving away from dramas, and, to this day, Nickelodeon doesn’t do dramas anymore. Did they ever give you any reason why they were moving away from dramas? Was it that the audience just wasn’t there for that kind of programming anymore? I know exactly what it was, and it was even earlier than that. When we finished our run in 1996, after we’d done 65 episodes—and 65 episodes was the golden number back then—I went and did a deal with Disney for some other things. The reason why I went back to Nickelodeon to do two more seasons of Are You Afraid of the Dark? was not because of the network, it was because of the Canadian producer who had the rights to the show all around the world. All of their five-year licenses on the show were running out, so they wanted foreign broadcasters to re-license the show, and to sweeten the pot, they said, “How about if we make new episodes?” By then, all the wounds had healed, so I agreed to do more episodes. But Nickelodeon wasn’t even a primary driving force for those last two seasons—they just licensed the show for those last two seasons. Nickelodeon was already moving away from doing dramas. Where Disney was the squeaky clean, perfect kids, Nickelodeon was real kids. now, if you look at Nickelodeon, they’re just following Disney. It’s so sad to see. The number one reason was budget. Comedies are much cheaper to do, and kids love comedies, so they went with the lowest-common-denominator. They figured they had a better chance of getting a hit with a comedy than a drama. I’m going way back now, but I got my start on ABC doing Afterschool Specials. Those were dramas for kids, and trey dealt with real issues. A lot of them were pretty earnest and over-the-top, but they gave young kids a chance to see their peers going through issues that they may be going through, and you just don’t see that anymore. I think it’s too expensive, and I think the networks just want to go the easy route, which is comedy. What was their definition of a “Disney kid”? A perfect, peaches-and-cream, apple-pie, freckle-faced kid, where Nickelodeon wanted real kids, warts and all. They made a big point of using visible minorities, to try to get as ethnically diverse as possible. We were nominated once for an NAACP Award for doing that. Where Disney was the squeaky clean, perfect kids, Nickelodeon was real kids—now, if you look at Nickelodeon, they’re just following Disney. It’s so sad to see. It’s true. If you were to name the shows my niece and nephews watch, I couldn’t tell you which network they’re on. They’re all interchangeable. Yeah, exactly. It’s all the same kind of stuff. It’s a case of “how the mighty have fallen.” Ironically, a lot of the people who were at Nickelodeon back when our show was there are at Disney now. A guy who runs the Disney Channel was a production assistant at Nickelodeon. I don’t know what happened. If I had to guess, it’s an issue of economics. When Nickelodeon started making money, they started getting more scrutinized, and they had to make more money. Or there’s just a lack of vision. Now that you’re writing popular YA fiction books, you’re still tapped into what younger audiences are looking for. Do you think a show like Are You Afraid of the Dark? could work in today’s different marketplace? If it ever got on the air, I think it’d do fun—I just don’t think it’d ever get on the air. I actually have a pitch out to Amazon now to do a similar series like that, and I’m waiting to hear back from them. Now it’s the online companies who are doing interesting things. It’s Netflix and Amazon. If Amazon doesn’t want to do the spooky show I’ve pitched, I’m going to do it as a book series. The thing is, kids love scary stories. They love dramatic stories. They love that kind of stuff. It’s one of the reasons why I write books now. I’m able to write the kind of stuff I like, whereas in TV I can’t do that anymore. I did a TV show a couple years ago called Flight 29 Down, about a group of kids who crash-landed on a deserted island and had to survive—it was kind of like Lord of the Flies meets Gilligan’s Island, basically. But it was a serious drama, on Discovery Kids for three seasons. The show ended up getting the plug pulled because Discovery Kids ran out of money after their deal with NBC ended. But we were sitting on this show that was really good, so we actually went to the Disney Channel. The Disney Channel’s reaction was, “This show is great…but it just doesn’t fit on our air. We don’t do shows like this.” And they’re absolutely correct! [Laughs.] They do not do shows like that. The problem is, why don’t they do shows like that? 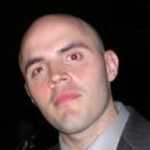 Matt Barone is a Complex senior staff writer who&apos;ll forever be Team "The Tale of Old Man Corcoran." He tweets here.